The government is being urged to introduce US-style yellow school buses for primary schools across Britain. 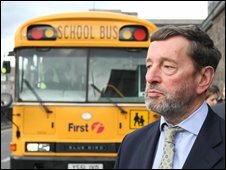 The Yellow School Bus Commission, chaired by the former education secretary, David Blunkett, said it could "revolutionise" the school run. A year-long review found the numbers of children being driven to school by car had doubled in the past 20 years. The cross-party commission found that introducing yellow buses could mean millions fewer car journeys each year. Currently, 6,600 UK pupils use yellow buses as part of 20 pilot schemes - they usually have extra safety features like CCTV and students generally have allocated seats. In its report, the commission says they offer numerous benefits - from a safe journey to school to reducing congestion, reducing pollution and improving attendance times at schools. It found that 41% of primary school pupils and 21% of secondary school pupils were being taken to school by car - accounting for 20% of car journeys during the morning rush hour and about one million tonnes of CO2 each year. The commission recommends that, for children living less than a mile from primary school or two miles from secondary school, they should be encouraged to walk or cycle. For primary school children living further away there should be a dedicated bus service, as there should be for secondary schools where there is no decent general bus service, or for schools where there are "serious behaviour problems" with pupils on public buses. The report suggests parents would pay £1 or £2 a day for their child to travel on the bus - those entitled to free school meals would travel free - and the additional cost of the primary school service would be about £154m, the report said. The secondary school scheme would cost £50-£100m, it said. But it suggests yellow buses for all primary schools and some secondary schools could save parents up to £92m a year in petrol costs and save more than 55,000 tonnes of carbon emissions a year. Mr Blunkett said: "This is about broad and highly relevant political issues as well as, crucially, the education, safety and security of our children. "We are proposing a long-term programme which could revolutionise the way we do the school run." He said, as well as saving parents' time, it would have an impact on society, business, energy conservation and climate change. Buses have been operating in areas including Aberdeen, Bristol, Essex, Merseyside, Medway in Kent, Northampton, Runnymede and Wokingham in Berkshire, Southampton, West Yorkshire and Wrexham. In the US, more than half of all children travel to school on yellow buses.